MyPhotographysite: Red Helicpoter in the afternoon. Red Helicpoter in the afternoon. 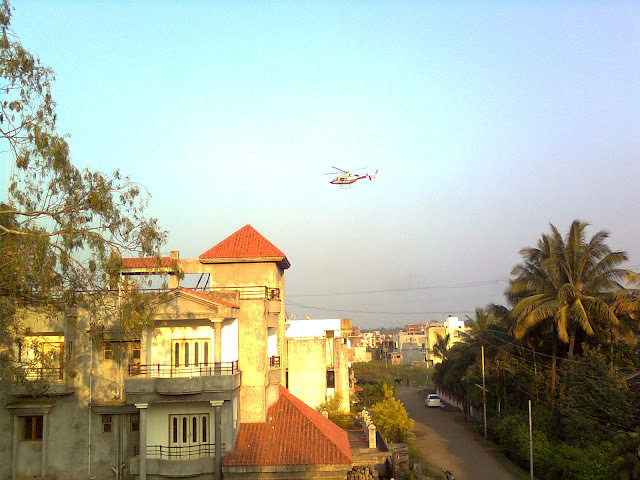 It was the afternoon time and I was surfing the Internet on my PC and suddenly I heard the helicopter sound and it was approaching near to my apartment. I was sitting in the hall and I had to run toward balcony so as to capture this photograph. The same helicopter came few days back and at that time I missed the camera and I saw it flying just few meters away from house. Hence, when it came back again, I shot it with my 2 Megapixel camera. Thank you Krishna for commenting. Have a nice day. Thank you Saru Madam. Have a nice day.